The first headbands were handsewn onto the head and tail of the text block as a protective measure. Today’s bindings generally feature headbands glued on to simulate those early handsewn headbands, providing a finishing touch to the binding. Headbands are still handsewn when the value of the book calls for a full, historically accurate restoration. 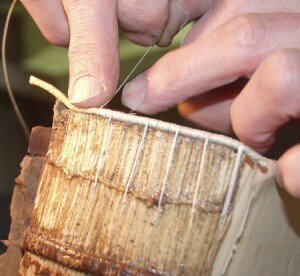 A headband being sewn onto a rare 18th century volume. The spine of the book has been removed, revealing the sewn signatures and a raised cord. The Currier Bindery is powered by Wordpress. Wordpress theme designed by Design Blog.